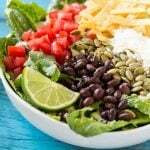 This recipe for Mexican caesar salad is crisp romaine lettuce tossed in a creamy cilantro dressing, then finished off with a variety of fun toppings. It’s caesar salad in a whole new way that might be even better than the original! Remember how last week I was raving about that chopped greek salad I made? This Mexican caesar salad is just as amazing (if not better!). Clearly it’s not a caesar salad in the traditional sense, but a lot of the same elements are there – romaine lettuce, creamy dressing, shaved cheese and here we’ve got tortilla strips in lieu of croutons. I also added some extra toppings because in my opinion that’s the best part of any salad! How do you make Mexican caesar salad? 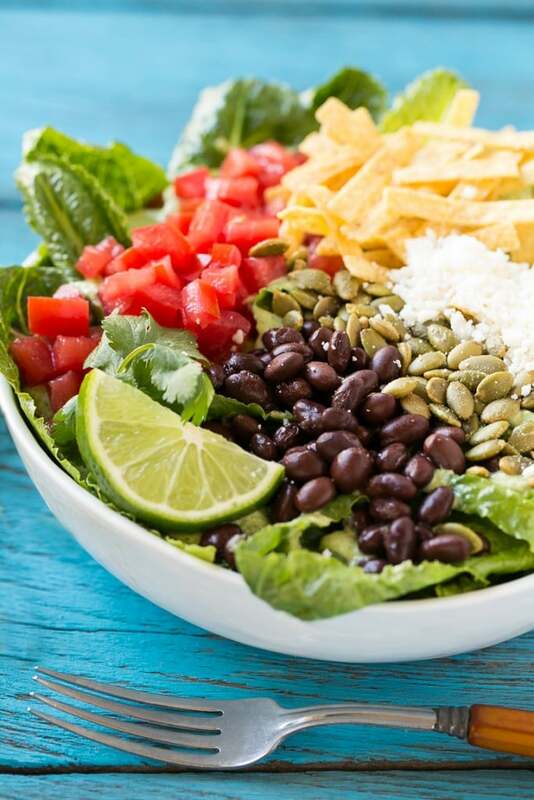 Romaine lettuce forms the base for this Mexican caesar salad and in the topping lineup we’ve got tortilla strips (you can also use crumbled chips), diced tomato, black beans, pepitas (aka toasted pumpkin seeds), crumbled cotija cheese and sliced avocado. It’s all topped off with a creamy cilantro dressing. The dressing is made in a blender or food processor and is full of ingredients that add a ton of flavor like green chiles, pepitas, cotija cheese, lots of cilantro and lime juice. Toss the dressing with the lettuce and toppings and you’ve got salad perfection. This Mexican caesar salad recipe can be easily doubled or tripled to feed a crowd, it would be the perfect contribution to a potluck! I like to make a batch of this salad and then eat it for lunch for days, so far I haven’t gotten tired of it. Regardless of how you eat it, you’ll love the bold flavors and textures in this caesar salad variation. 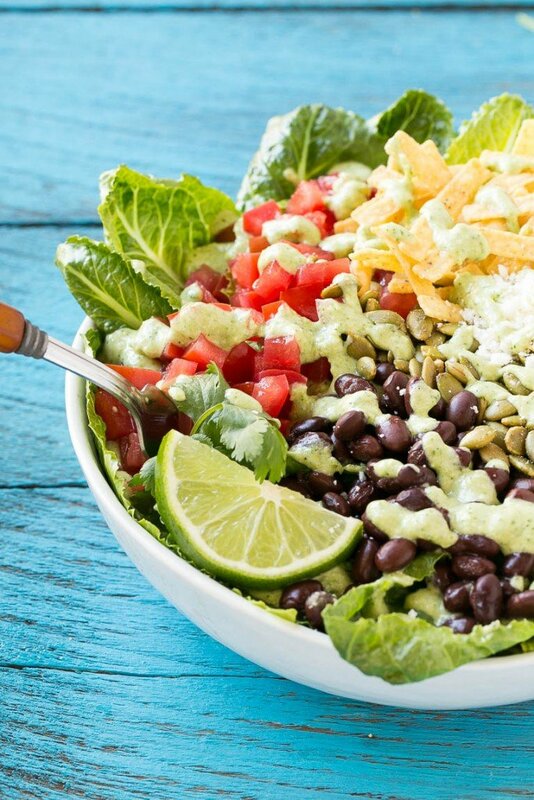 This recipe for Mexican caesar salad is crisp romaine lettuce tossed in a creamy cilantro dressing, then finished off with a variety of fun toppings. It's caesar salad in a whole new way that might be even better than the original! Place all of the salad dressing ingredients in a food processor or blender and blend until smooth. Add a little water if needed to get to a pouring consistency.Taste and season with additional salt and pepper if desired. 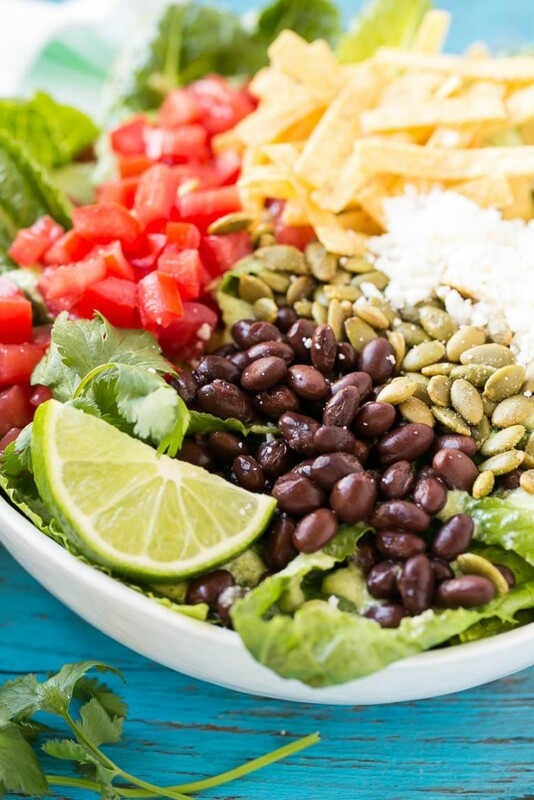 Place the lettuce, tomatoes and beans in a large bowl. Add the dressing (in the amount you prefer) and toss to coat. Top the salad with tortilla strips, cotija cheese and avocado slices. Garnish with cilantro leaves and lime wedges if desired and serve immediately. Cotija cheese can be found in most grocery stores, mine was in the regular cheese aisle but the check the specialty cheese area in the deli too. Feta is an acceptable substitute. Mild green chiles come in small cans in the mexican food area, I use the ortega brand. I made this last night to go with tamales and it was excellent! I wouldn’t change a thing. I used sprouted pumpkin seeds (not roasted or salted) and they were great. The cotija cheese makes all the difference too – feta would definitely work but cotija makes it more authentic. Delicious. You realize Caeser salad is Mexican to begin with. 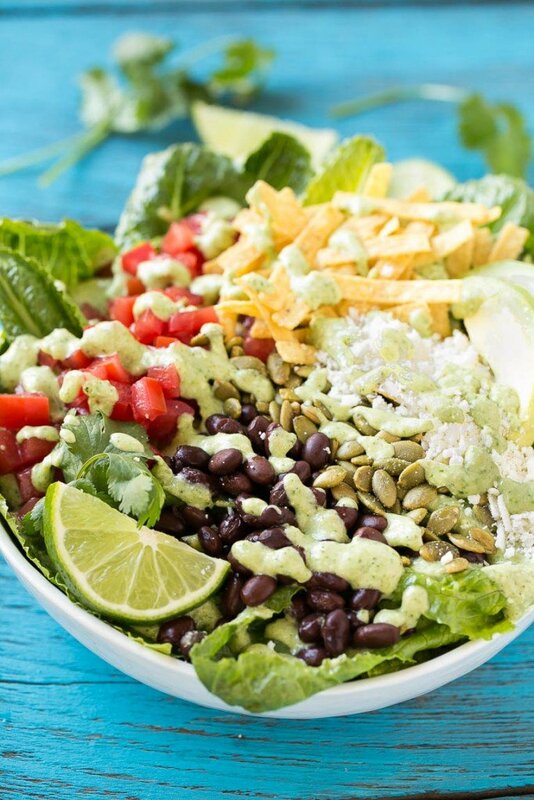 Love anything Mexican and this salad looks fabulous! What a great idea! The salad looks amazing. This sounds so dang good! I’m obsessed with Mexican food AND caesar salads so this is PERFECT!! I can’t wait to try it! My kids (and I!) would love this!! I really love the flavors in the dressing – I can’t wait to try it. I am such a huge fan of big, fun salads for dinner. this is just amazing! we love salad night, and this one would be great as a make your own salad bar dinner for the kids. Now this is a salad! I adore the dressing with the pepitas in it. This would be perfect for lunch or dinner. What a fantastic twist on a salad. I love Caesar salad but have never attempted such a unique twist on the classic! It looks absolutely delicious, just like all of your recipes!